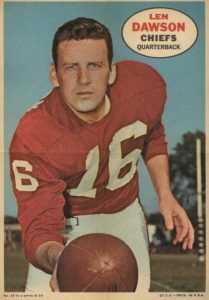 Len Dawson, quarterback and legendary leader of the Kansas City Chiefs, guided the team to two Super Bowl appearances and a title in Super Bowl IV. With his accurate passing and ability to scramble on broken plays, the Chiefs offense famously became experts at "matriculating the ball down the field." 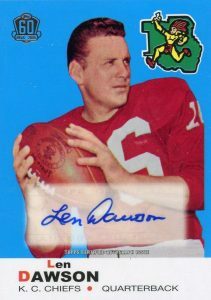 This list highlights some of the key Len Dawson football cards, including his rookie card from an obscure card maker and more recent autograph appearances. 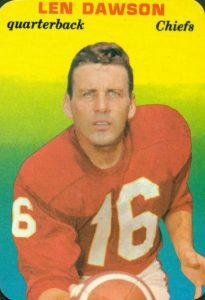 Although most fans remember Dawson as the Chiefs' long-time quarterback, he was initially selected by the Pittsburgh Steelers in the 1957 AFL Draft. He later found a permanent home with the Dallas Texans, who moved to Kansas City in 1963. Dawson would go on to win three AFL Championships with the Chiefs. After falling short in Super Bowl I, Dawson led the team to victory in Super Bowl IV over the Minnesota Vikings and was named the game's MVP. In all, Dawson played an impressive 19 seasons and was selected to the Pro Football Hall of Fame in 1987. 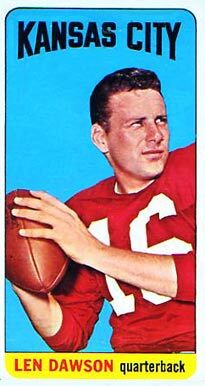 Shop for Professionally Graded Len Dawson cards on eBay. 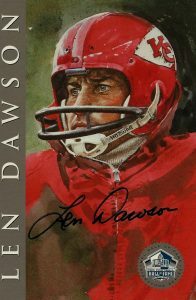 For signature collectors, there are a few notable Len Dawson autographs to consider adding to your collection. The 1997 Donruss Football set offered autographs using the 1948-49 Leaf Football design, making some very beautiful and unique cards. In 2007 Topps Co-Signers, Dawson was featured along with his Super Bowl I opponent Bart Starr on a dual autograph. In 2016 Panini Prime Signatures, Dawson is paired with Chiefs quarterback Alex Smith in another dual signature card. Other recent sets featuring Dawson autographs include 2015 Panini Flawless and 2016 Panini Gala. 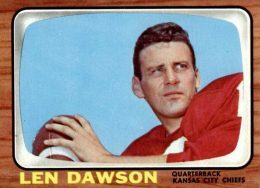 Dawson's pro career spanned nearly two decades, allowing him to amass a sizable football card collection featuring hundreds of options. In determining list placement, a key component is the card's value, followed by the design and the set's historical importance. Collectors have three Dawson cards to choose from in the 1972 Topps set. The choices include his standard base card, a 1971 passing leaders card, and the Pro Action card featured below. 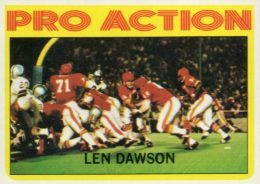 After years of posed football cards, the Pro Action cards were a breath of fresh air to Topps Football and Dawson can be seen handing off to the Chiefs running back at the goal line. Dawson's Pro Action card is in the rarer third series of the set, giving it an increased value compared to other Pro Action cards on the checklist. Dawson was featured as one of the 33 cards included in the Super Glossy subset of 1970 Topps. Collectors could pull these glossy cards printed on white cardboard with an almost psychedelic rainbow background from packs of Series 2. While the fronts feature some of the most famous football card imagery, the reverse side is a bit disappointing with just a simple white background and only the player's name, position, team, and card number provided. The 1968 Topps Posters set was issued as its own independent product instead of an insert set and fans could buy a pack that included one poster and a stick of gum. The posters originally came folded up in the pack, therefore, they were frequently damaged by kids folding and unfolding the poster, again and again. Sixteen players from both the AFL and NFL were featured on the paper posters that measured 5" by 7" when unfolded. 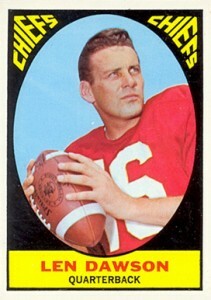 The 1967 Topps color scheme changed from team to team and the Chiefs were given a black and yellow design. Personally, I am also a fan of the alternating font sizes used in the corner of the cards that bring a unique detail to the set's design. 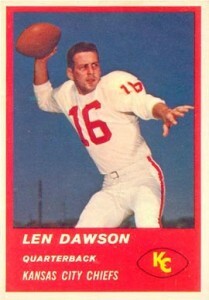 The reverse side of Dawson's card highlights his statistical dominance over other AFL passers of his day, including leading the league in completion percentage nine times in his career. To celebrate Topps' 60th Anniversary of producing football cards, the company released an online-only set that featured autographs of many retired legends. The 2015 Topps 60th Anniversary Retired Autograph set typically featured autographs on slightly redesigned rookie cards for the stars, however, Dawson's sky blue card is actually from 1969 Topps. Meanwhile, his first Topps card can be found in 1964 Topps (and also at #2 on this list). Borrowing a page from the legendary 1955 Bowman Baseball set, 1966 Topps features a similar television set design. For the third straight season, the product features only AFL players. Because the set shrunk down to just 132 cards, this eliminated the short prints that made the 1964 and 1965 releases so difficult for set builders. Interestingly, the 1966 set also featured a Funny Rings subset inserted into packs that included a paper ring to be punched out and worn. The NFL Player's Association issued the Hall of Fame Signature Series set in 1998 to raise funds for former players who had struggled with financial problems since their retirement. Each autographed art card was limited to 2,500 copies and Dawson's card was created by artist Merv Corning. Collectors could purchase all 116 NFL greats featured in one large set, making it one of the most remarkable collections of autographs in a single group. Despite the larger print run, they are not as commonly found today but Dawson has signed a fair amount of other cards over the years. 1965 Topps is arguably the most popular football set Topps ever issued mainly because of the unique design which featured a tall and narrow base card that measured 2-1/2" wide and 5" tall. Like the previous year, short prints are plentiful throughout the set rather than just the high-numbered final series. Dawson's card was short-printed and the back of the card highlights his strong collegiate career that saw him play for Purdue University and lead the Big Ten in passing for three seasons. The 1964 Topps set was the company's first release that only featured AFL teams and because of the set's unusual 176-card checklist size, many of the cards have been found to be short prints. Dawson's card is among these more limited options, giving his first Topps appearance an extra value boost. Featuring mainly player portraits, and a few full-body photos, surrounded by a row of stars, Dawson's card showcases him on a field of green. 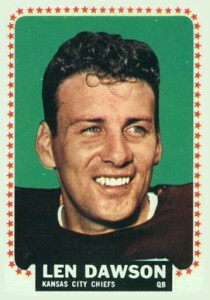 After six seasons, and three teams, Dawson finally graced a football card in 1963 Fleer. Fleer issued four sets in the 1960s featuring mainly AFL players. The 1963 set would prove to be the company's last football product until the mid-1970s when they issued Team Action sets featuring in-game photography. The bright red borders work well with the Chiefs' color scheme and Dawson's card is one of the top rookies. 1963 Fleer is very difficult to find in mint condition and graded versions in near-mint condition and above for Dawson can reach $500 at auction.